In lieu of an outright ban, draft regulation from the province offers a drooping olive branch to restore goodwill between police and communities of colour. 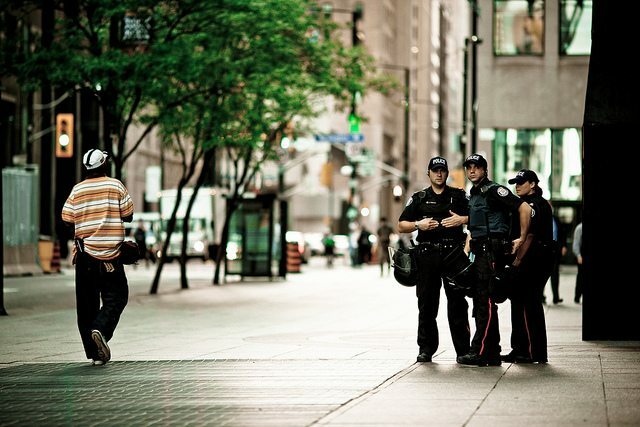 Photo by Harry Choi, from the Torontoist Flickr Pool. How do you legislate against racial bias? If you’re looking for a serious solution to this riddle, you’ll be hard pressed to find it from the province. This afternoon, Ontario proposed new police carding regulations to ostensibly protect civil liberties of members of the public during police interactions. The only trouble is that, as some have reasonably feared, those proposed changes don’t appear to differ wildly from the procedures currently in place. The most significant change introduced by the province’s draft regulation on carding is the introduction of language that explicitly prohibits police checks solely on the grounds of race. Police will also be barred from collecting information based on random or arbitrary stops. Of course, whether stops are in fact conducted arbitrarily or are influenced by racial bias is difficult to prove. There are also exceptions under which the proposed regulation would not apply. Officers who are undercover, for example, will be exempt from the new guidelines.